The evidence of the Brahmachârin is corroborated from an entirely different source in the same issue of The Theosophist, namely in the letter entitled “Existence of the Himalayan Mahatmas,” to which H. P. B. attached an editorial note. See further in the present volume. Upâsika, meaning female disciple, stands for H. P. Blavatsky. The letter from which the above quotation is taken was received in November, 1882, and can be found in Letters From the Masters of the Wisdom, Second Series, Transcribed and Annotated by C. Jinarâjadâsa, Adyar: Theos. Publ. House, 1925. It would appear that Mohini’s account was not published at the time owing to the fact that another account, namely, by S. Ramaswamier, appeared in The Theosophist (see below). Its publication was delayed until December, 1883. EDITOR’S NOTE.—Secondary evidence is no longer necessary. 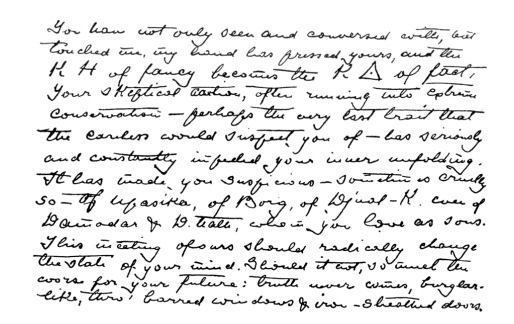 On November the 20th at 10 A.M. two telegrams were received by us, dated Lahore, one from Colonel Olcott, who notified us that he had been visited in person by Mahatma “K. H.” on the preceding night; and the other—from Mr. W. T. Brown, F.T.S. of the “London Lodge,” Theosophical Society, in these words: “Visited early this morning by Mahatma K. H. who left me a silk handkerchief as a memorial, etc. !” and today 22nd having telegraphed to both those gentlemen for permission to announce the long expected event in The Theosophist, we received an answer that not only could “Master’s visit be mentioned,” but that our President, Mr. Brown, and Mr. Damodar “had another call last night near their tent, the Master being accompanied in flesh and body by brother Djual Khool.” Unless Mr. W. T. Brown, to complete the trio, be classed by our Spiritualistic friends also among the “Occidental Humourists,” the question as to real existence of the Mahatma, is pretty well settled now. One witness may be mistaken as to facts, and even a doubt may be cast upon the evidence of two witnesses. But when it comes to the testimony of three or more witnesses speaking to a fact that occurred in their presence doubt would become absurd even in a Court of Justice. We have not yet received the particulars, but since we have been notified that Mahatma K. H. on his way to Siam would most likely pass via Madras in a week or so, we have every reason to suppose that our President and Mr. Brown saw the real, living body, not merely as before—the astral form of the Master. “Since the commencement of your probationary term in America, you have had much to do with me, tho’ your imperfect development has often made you mistake me for Atrya, and often to fancy your own mind at work when it was mine trying to influence and to talk with yours. Of course, by your own canons of evidence you have not until now been a thoroughly qualified witness, since we have never previously— to your knowledge—met in the flesh. But at last you are, and one object in view in my making the journey from the Ashrum to Lahore was to give you this last substantial proof. You have not only seen and conversed with, but touched me, my hand has pressed yours, and the K.H. of fancy becomes the K of fact. Your skeptical action, often running into extreme conservatism—perhaps the very last trait that the careless would suspect you of—has seriously and constantly impeded your inner unfolding. It has made you suspicious—sometimes cruelly so—of Upasika, of Borg, of Djual-K. even of Damodar and D. Nath, whom you love as sons. This meeting of ours should radically change the state of your mind. Should it not, so much the worse for your future: truth never comes, burglar-like, thro’ barred windows & iron-sheathed doors. “I come to you not alone of my own accord and wish, but also by order of the Maha Chohan, to whose insight the future lies like an open page. At New York you demanded of M. an objective proof that his visit to you was not a maya—& he gave it; unasked, I give you the present one: tho’ I pass out of your sight this note will be to you the reminder of our conferences. I now go to young Mr. Brown to try his intuitiveness. Tomorrow night when the camp is quiet & the worst of the emanations from your audience have passed away, I shall visit you again, for a longer conversation, as you must be forewarned against certain things in the future. Fear not and doubt not as you have feared & doubted at supper last night: the first month of the coming year of your era will have hardly dawned when two more of the ‘enemies’ will have passed away. Ever be vigilant, zealous and judicious; for remember that the usefulness of the Theosophical Society largely depends upon your exertions, and that our blessings follow its suffering ‘Founders’ and all who help on their work. reproduction is to its exact size, facsimiles I and II making one side of the paper, and III and IV the other. In this letter, D. Nath stands for Dharbagiri Nath, known also as “Bawaji,” whose actual name was S. Krishnamachâri or Krishnamaswami. Bawaji went with H.P.B. to Europe in 1884 and 1885, but turned later against her. His name of Dharbagiri Nath gave rise to a lot of unnecessary confusion. It was originally the name of a very high Chela of Master K.H. Bawaji stood in some special occult relationship to this high Chela, being allowed to take his name as a “mystery name” when Bawaji became a probationary chela. It is probable that the high Chela of that name took possession of Bawaji’s body upon occasion until the latter failed. (Cf. 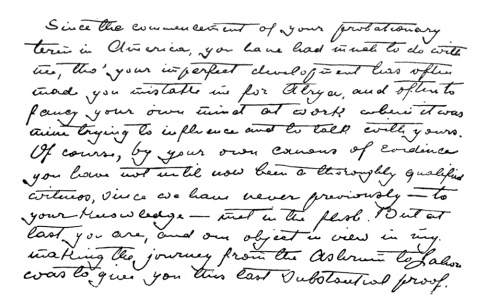 The Letters of H. P. Blavatsky to A. P. Sinnett, pp. 173, 174.) The term Upâsika has reference to H.P.B. herself. Djual-K. stands for Djual-Khool, the favorite disciple of Master K. H., who since those days has himself reached the state of Mahatmaship. 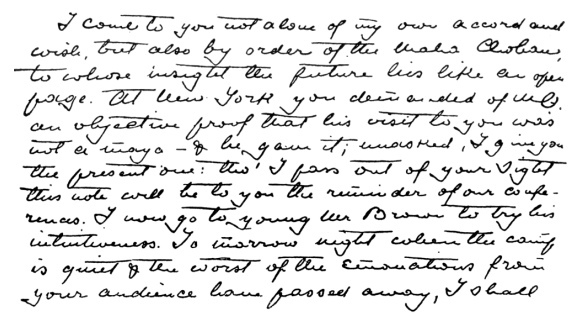 The “objective proof” spoken of in the latter was the fe˜â or turban, now in the Archives at Adyar, which Master M. left with Col. Olcott as a proof that his visit to him in New York was a reality (Cf. Old Diary Leaves, I, pp. 379-80). A photograph of this turban has been published in The Theosophist, Vol. LIII, August, 1932, pp. 496-97. ‘What Damodar told you at Poona is true. We approach nearer and nearer to a person as he goes on preparing himself. In W. T. Brown’s pamphlet on Some Experiences in India, the letter quoted above is merely referred to. What became of the original is not definitely known. “Watch for the signal: prepare to follow the messenger who will come for you. 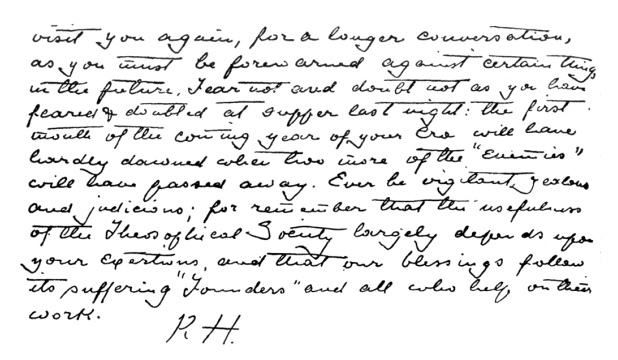 The account of this second meeting can be found in Old Diary Leaves, III, 41-43. The messenger spoken of was Djual-Khool. The text of both letters can also be found in Letters from the Masters of the Wisdom, First Series, Transcribed and Compiled by C. Jinarâjadâsa, Theosophical Publishing House, Adyar, Madras, India; 4th ed., 1948, pp. 44-46. Facsimiles are from The Theosophist, August 1932, pp. 567-570, 573. These visits of Master K. H. are also mentioned in The Letters of H. P. Blavatsky to A. P. Sinnett, p. 72, and in Wm. Tournay Brown’s pamphlet entitled Some Experiences in India, the original of which is extremely rare. It was published by Dr. Franz Hartmann and Richard Harte, London, under authority of the London Lodge, T. S. It has, however, been reprinted in The Canadian Theosophist, Toronto, Vol. XXVIII, No. 4, June 15, 1947, pp. 117-25. As to Wm. Tournay Brown, he was an earnest and aspiring young man from Scotland. After a long course of study pursued in Strassburg, Zurich and Edinburgh, he was graduated at the University of Glasgow, April, 1882, and went on a long holiday trip to Canada and the United States. After the trip, his health being rather precarious, he was treated and greatly helped by the eminent homeopath, Dr. Nichols, with whom he resided in London in 1883. At the house of this doctor, he met Frau Gustav Gebhard, of Elberfelt, Germany, who was a pupil of Éliphas Lévi and had come to England to be initiated into the Theosophical Society by A. P. Sinnett, who had just then arrived from India Mr. Brown soon became deeply interested in occult literature, met Mr. Sinnett and was admitted into the T. S.
He conceived a strong desire to go to India, in order to participate in the work of the T. S., and thus to draw nearer to the great Teachers themselves. He sailed on August 25, 1883. He was received with open arms by both H. P. B. and Col. Olcott. The latter, then on a protracted tour of India, took occasion to explain to him in a letter the opportunities as well as the dangers connected with his present decision and gave him some specific warnings. Mr. Brown nevertheless eagerly joined Col. Olcott on his tour, overtaking him at Sholapore. It was during this tour that the two successive meetings with Master K. H. took place near Lahore, as described by Col. Olcott, and mentioned in the above Editorial Note by H. P. B.
Brown’s case, however, was one of those sad cases of which the Theosophical Movement has had a considerable number. Col.